It’s Official! Love has Arrived. 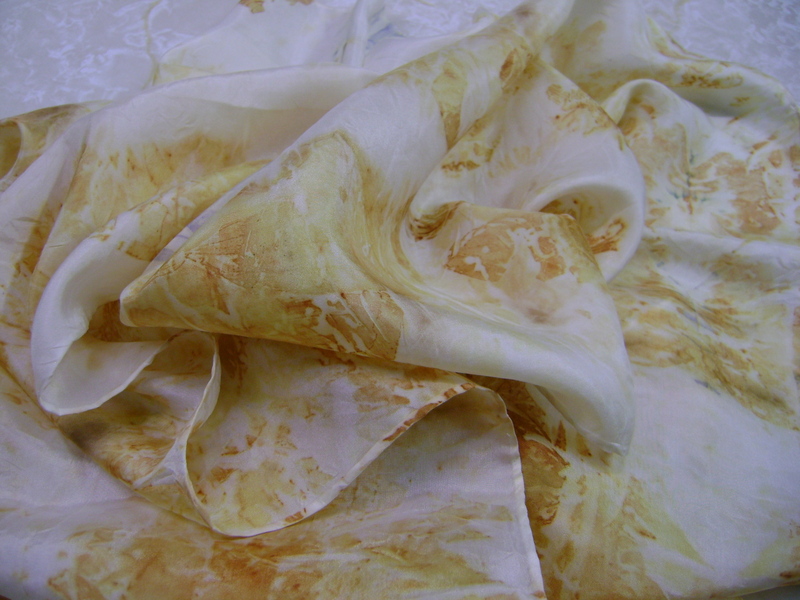 I am officially in love with raw silk. A couple of posts back I posted a photo of a piece of raw silk that I dyed with onion skins. 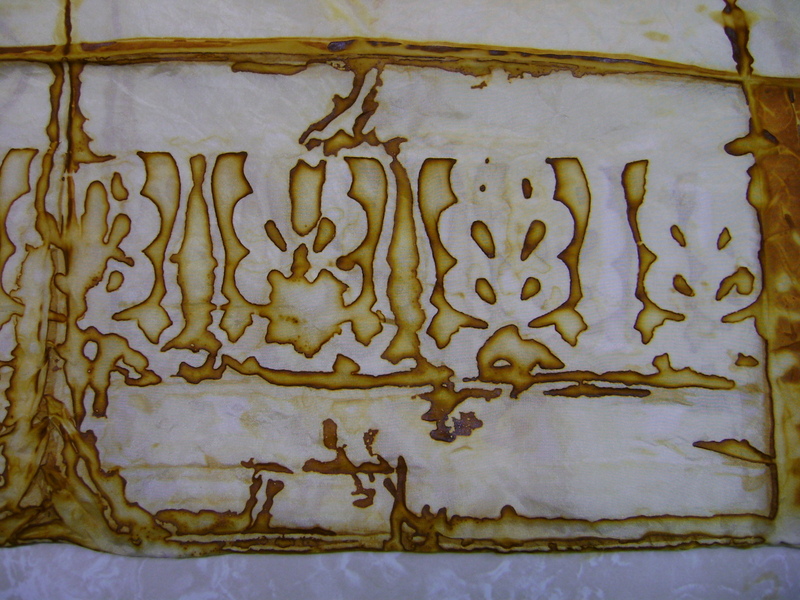 I am going to post some closeups of the patterning here, because I am not convinced the other photo did it justice! Stop! 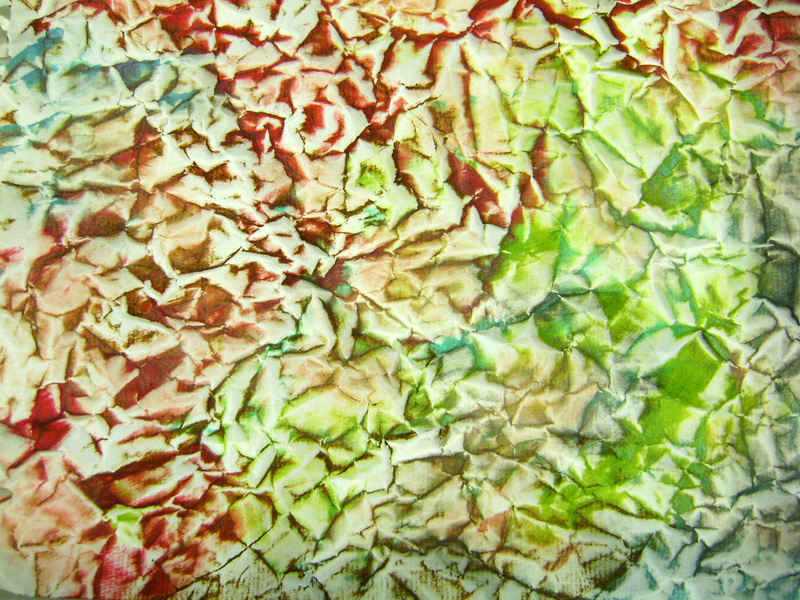 Don’t Throw That Leftover Dye Out! 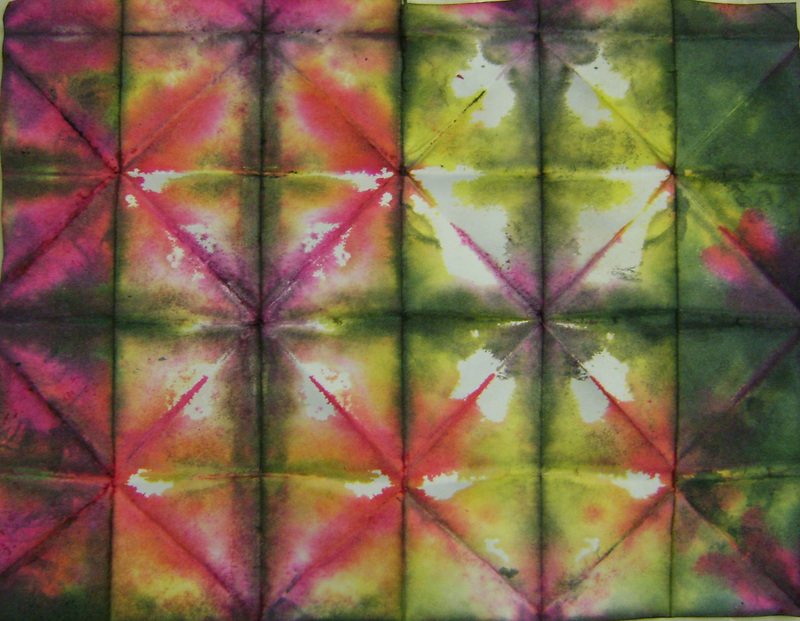 Two papers I dyed with leftover dyes… after I made a Shibori folded pattern with the paper. 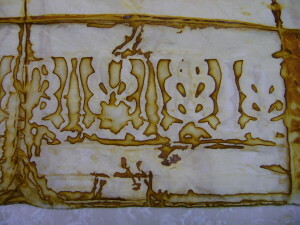 The edges were then dipped in three different dye colors. Wonderful! This was plain white copy paper. Such nice contrasts. 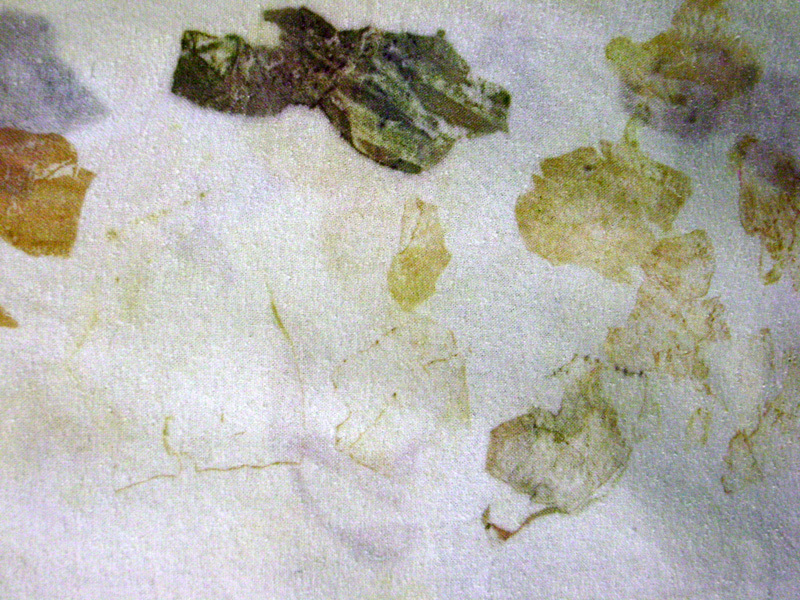 The next paper is charcoal drawing paper that has been crumpled up and straightened back out. 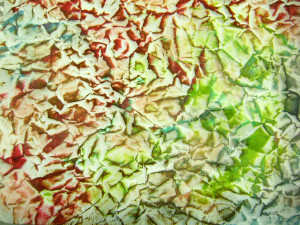 The texture comes from brushing ink pads over the bumps. 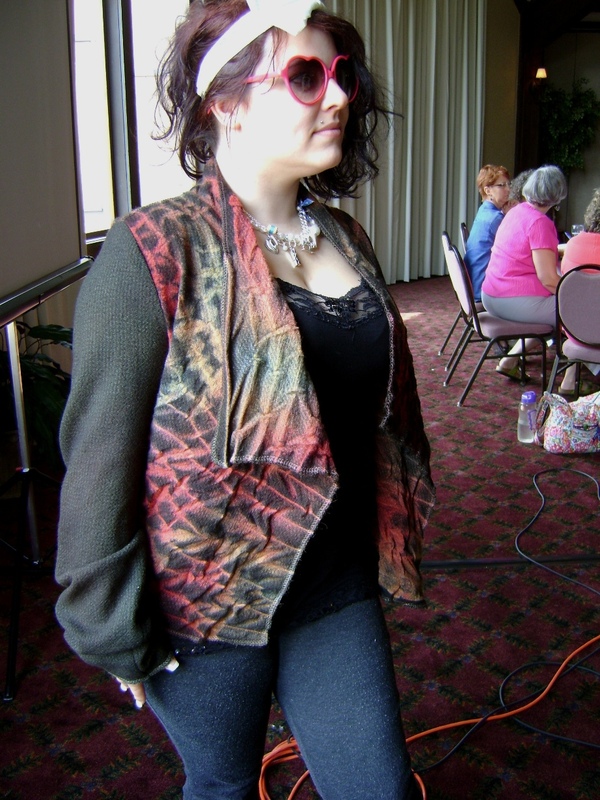 I am a part of a project in MoFA (Missouri Fiber Artists) called Pairings. 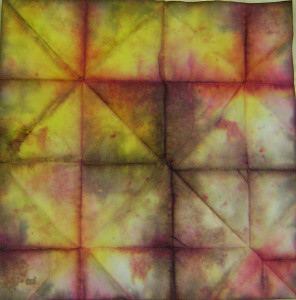 The point of the project is to pair up with someone and trade visits to each other’s studios, spend time together learning from each other and then eventually do a collaboration art piece. My “Pairing” turned into a trio because a friend wanted in the project, but there was no one to pair with her at the time, so I asked to put her with my pair. So three of us will be collaborating. We have already had our first studio visit as they came to my place a couple of weeks ago. My two partners in crime, Susan Spineto on the right and Karen Turner on the left. Both are from the St.Louis/Alton area. So, decisions were made that day of our meet up. We decided on the size of our collaboration and where we would start. 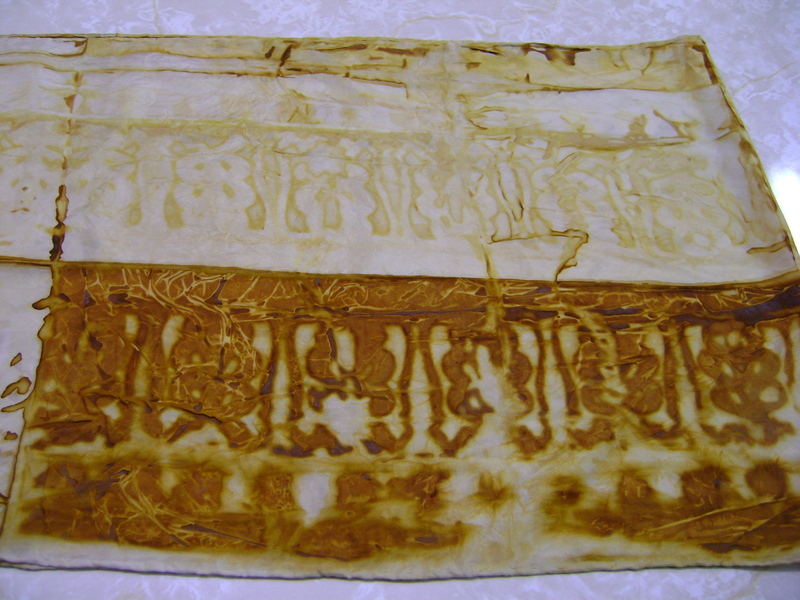 So here is the start….raw silk dyed with two colors of onion skins. I knew they would be beautiful. 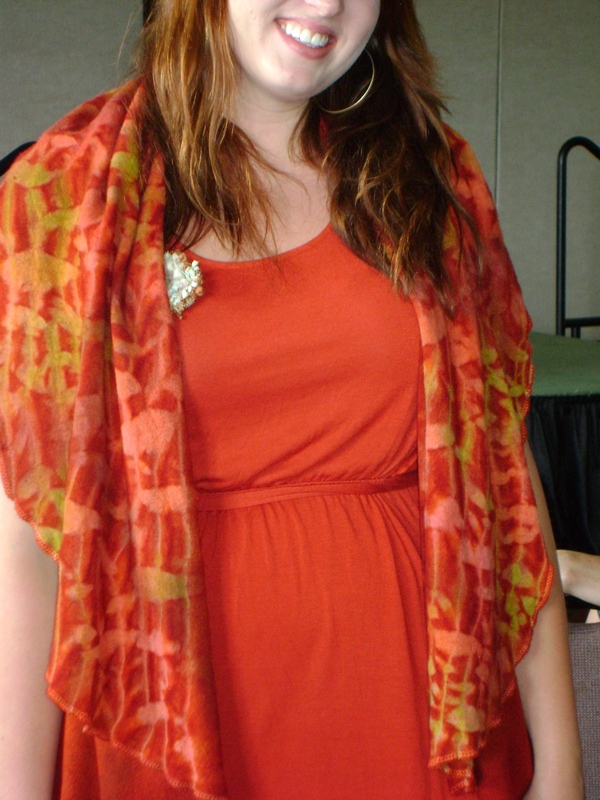 I love silk crepe. 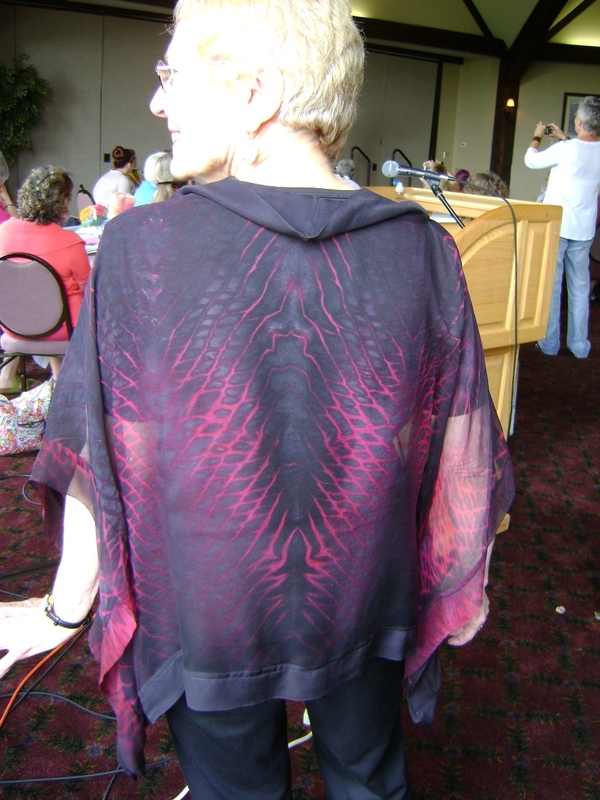 I think it is the most beautiful of the silks. It has weight. It has class. It has style. 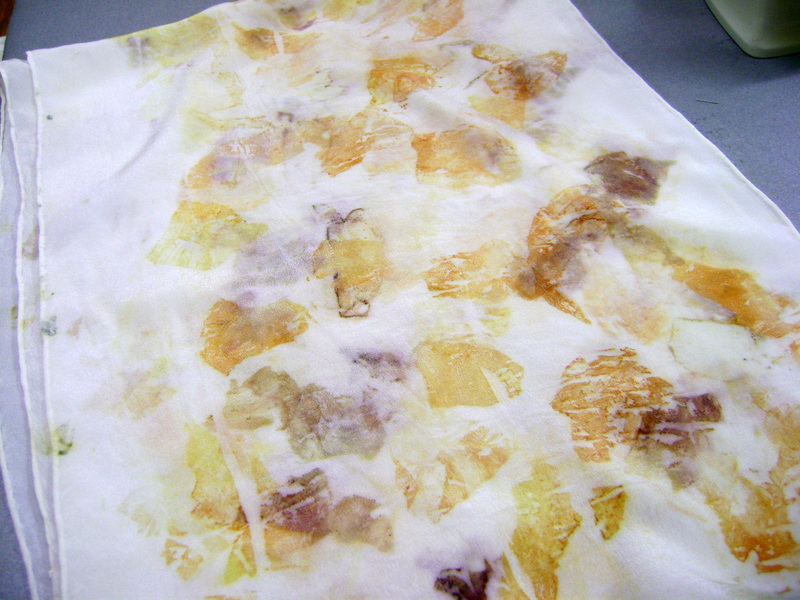 So I rolled up red and yellow onion skins in a scarf….and voila!….I am totally smitten. 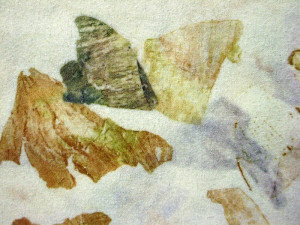 I have developed an interest in natural dyeing. The MoFA girls do a lot of that and it intrigues me, so I am trying my hand at it. 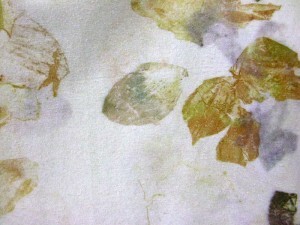 First try at natural dyeing: I used peony leaves and rose leaves, rolled up in a silk hababoi scarf and steamed. Results: not so much, kinda bland. So on an impulse, I dipped it in some rusty water-vinegar mixture and voila!~ The scarf turned a nice smoky gray color and the leaves all finally showed up! Ok, I already showed you that one in a prior post. The next natural dyeing I tried was with onion skins, again all wrapped up in silk Habatoi scarves and steamed. They might need some gray. 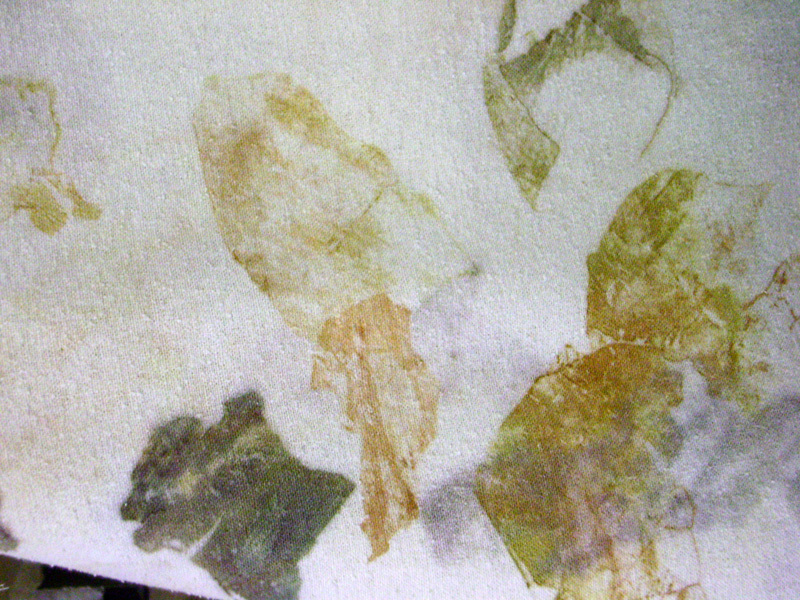 The bamboo sticks I wrapped them around left a gray marking that I like very well, if I could just figure out how to get it over into the other areas…. 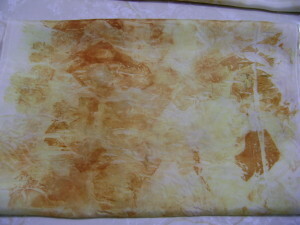 Next on the agenda are some rust dyed scarves. 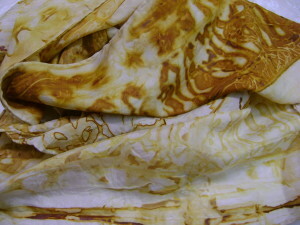 Again, these are silk Habatoi. I am out of silk crepe de chine and eagerly wanting to order a few to try natural dyeing on. 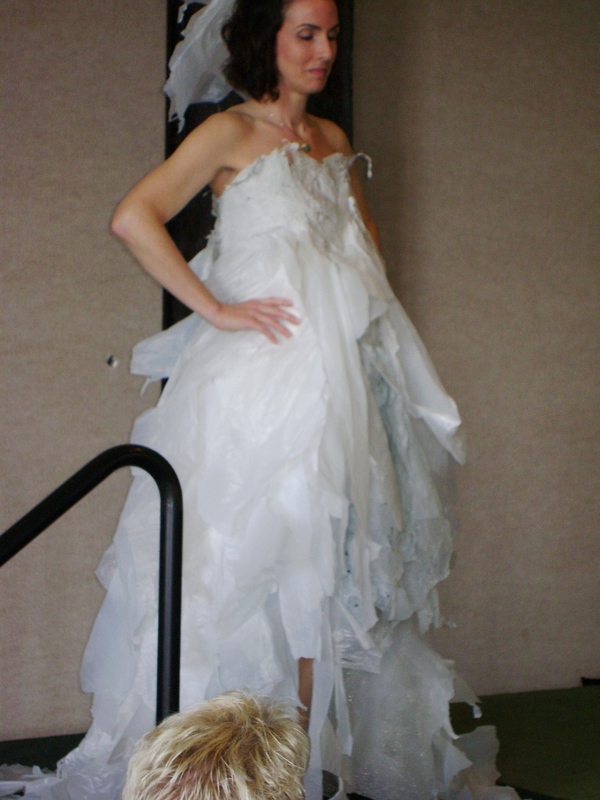 My how time does fly….I haven’t blogged for far too long. I’m going to have get better at this. 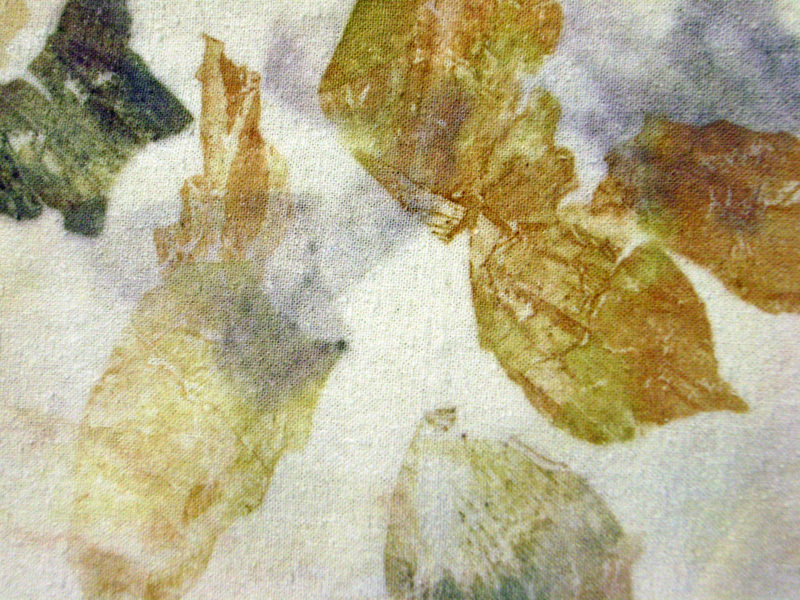 Since the last post, I have tried my hand at natural dyeing. I heard that peony leaves were good for this and rose leaves. I have plenty of peony bushes and the flowers are now exhausted, so there are lots of leaves. I gathered up all the leaves from them and my rose bushes. I wrapped leaves in a silk chiffon scarf and a crepe de chine. The results were less than desirable. 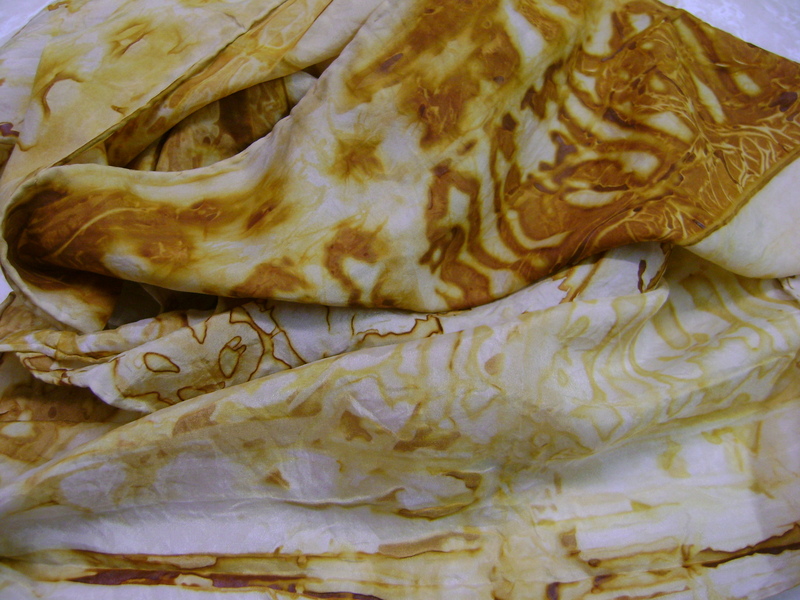 The chiffon barely showed any marks and the crepe de chine did have some on it. 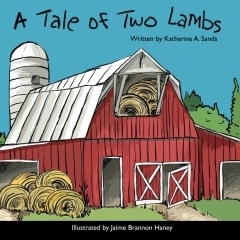 The day I wrapped and bundled them, I stuck a huge hunk of steel in a mixture of vinegar and water. It sat there changing the water into a dark sludge. On a whim, I stuck both scarves in the rusty sludge. Oh my! What a difference that made! 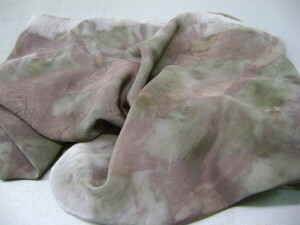 Both scarves went instantly to smoky gray colors and even after rinsing, it stayed. The leaves now can clearly be seen on the crepe de chine in a reddish brown color. The transformation is amazing. 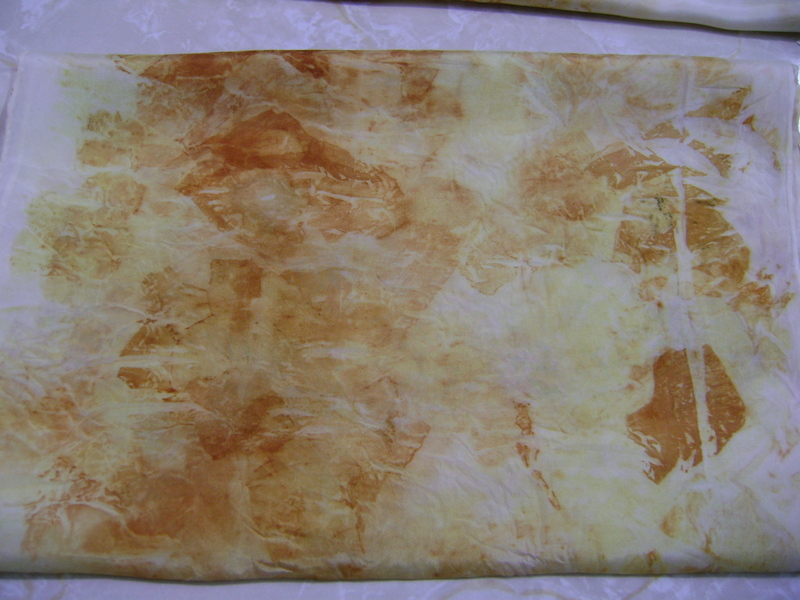 The chiffon came out with softer colors and may need some more application of something…. I have had a busy week…3 of my nieces came down to visit my studio. Two of them wanted to make a quilt; the third wanted help making a pieced pillow. They wore me out! 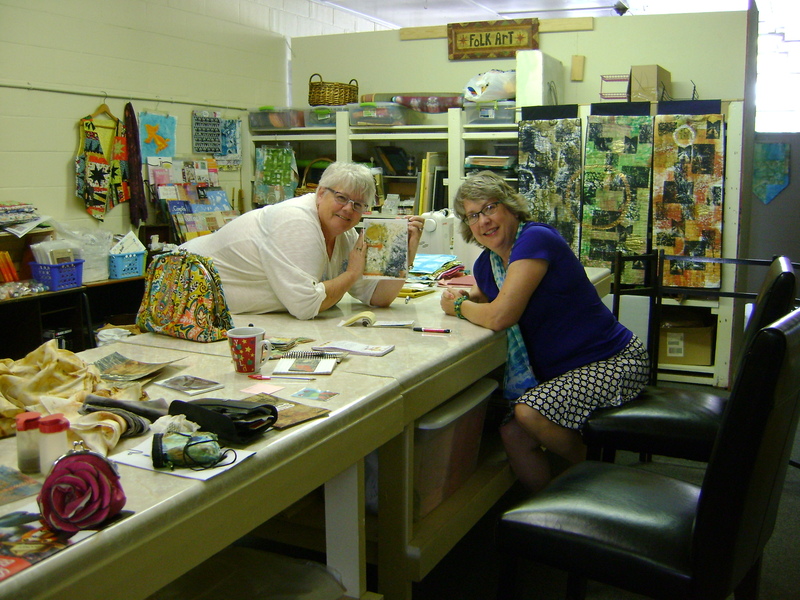 We stayed up pretty late the first night sewing…later than I am used to staying up. That made for a late morning the next day, but by noon we were at it again. I’m so proud of all of them. 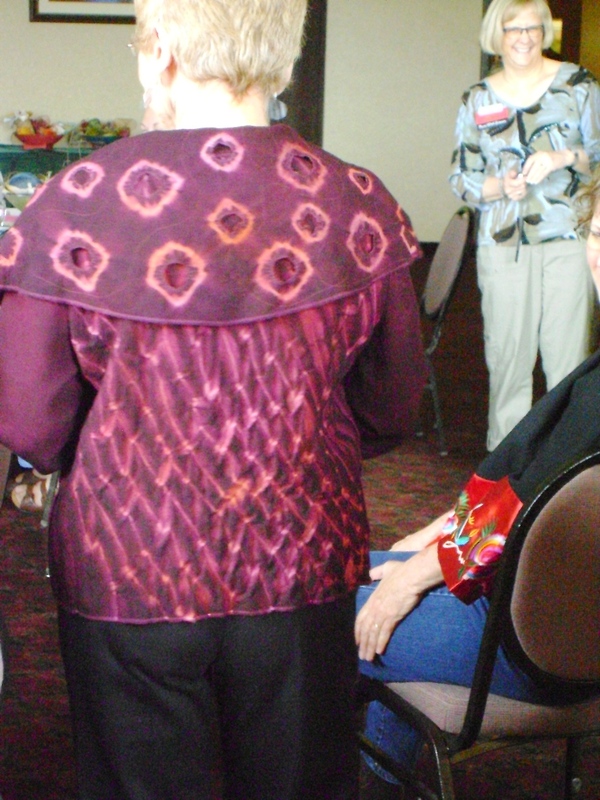 With little or no experience in sewing or piecing, they did very well! A couple of weeks ago I had a play day with Lynda of Bloom, Bake, Create fame. 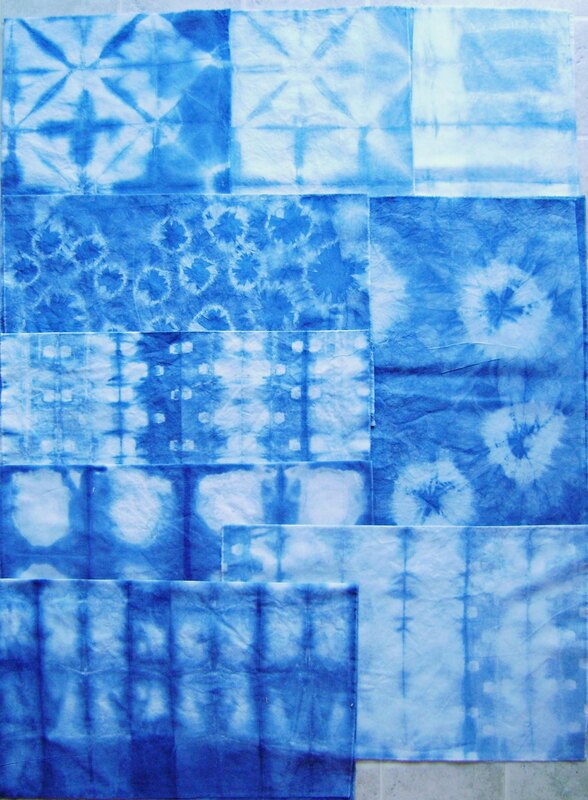 We had been planning for some time to try out indigo dyeing. I finally had a day free! 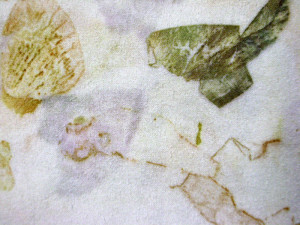 Here are my cotton cloth prints. I also tried three kinds of silk scarves in the vat but did not leave them in long enough. I attempted to re-dye them the next day in the vat, but it had oxidized too much. 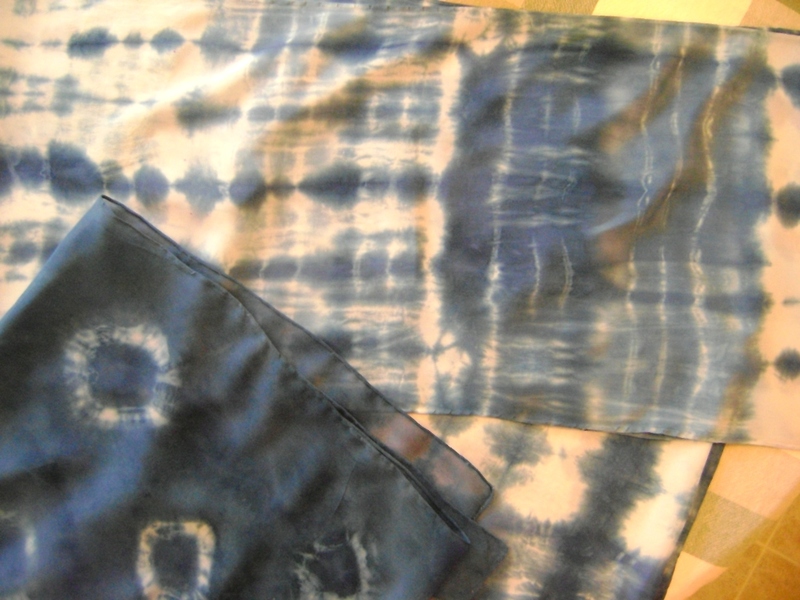 I then over-dyed them with a procion dye which actually turned out similar to the indigo dyeing. 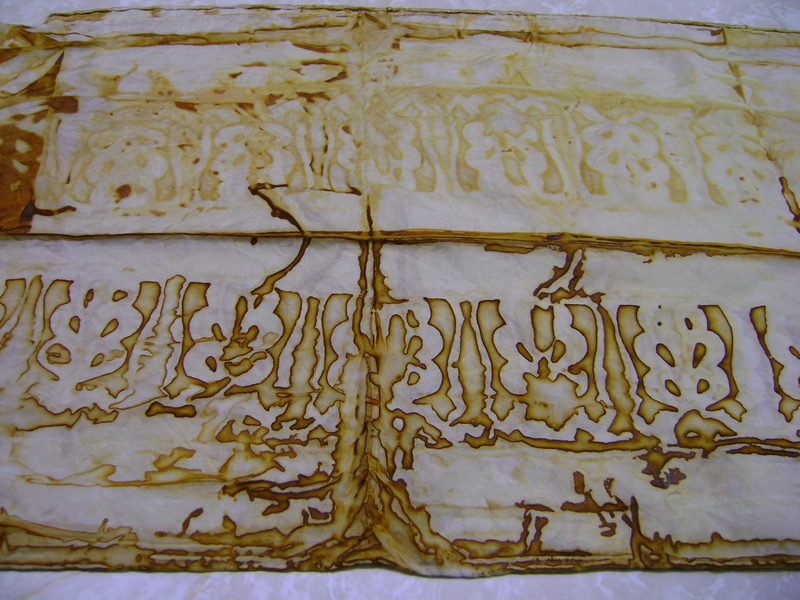 On the left, silk chiffon (yummm! 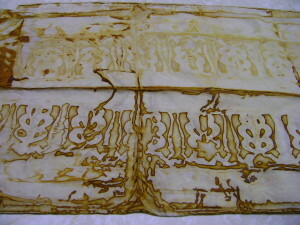 ), then a silk crepe, and a silk habatoi. Dyeing, Dyeing, and More Dyeing…. 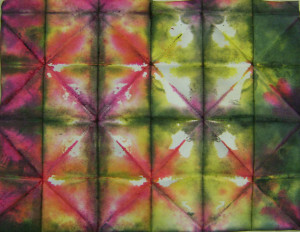 A few weeks ago I spent a day doing some dyeing. 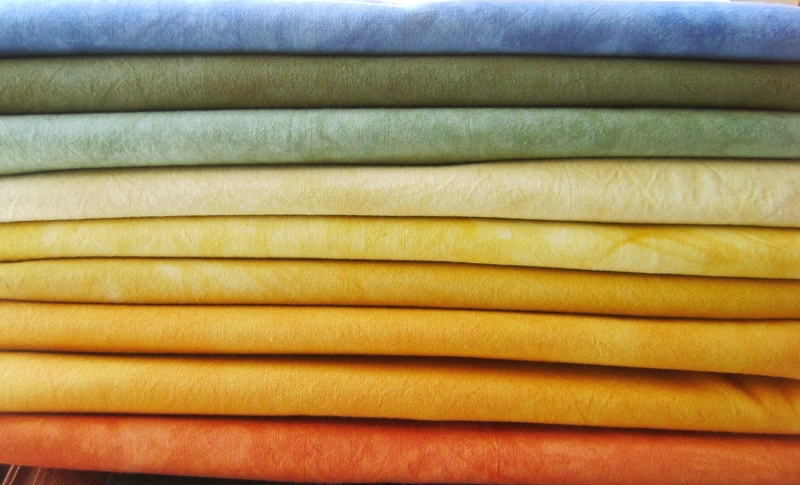 I realized that my stacks of hand dyed fabrics to sell was getting mighty low. So I spent a day dyeing and then hours of ironing to get them ready to sell. I love the palette of colors I ended up with…butterscotch, curry, terra cotta, olive in light and dark, and indigo blue. 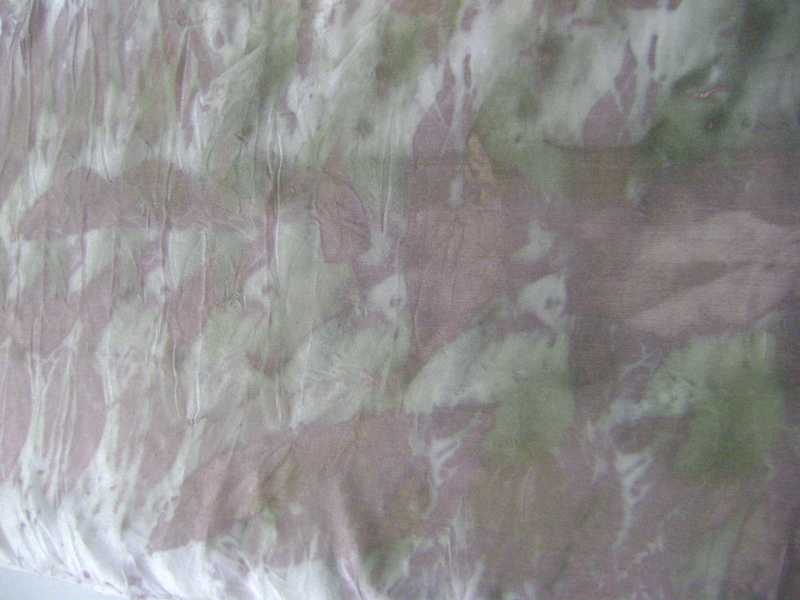 I decided to dye in such a way that I could get a piece with lighter value in the same tub as the the darker ones. They look so yummy all stacked up together! 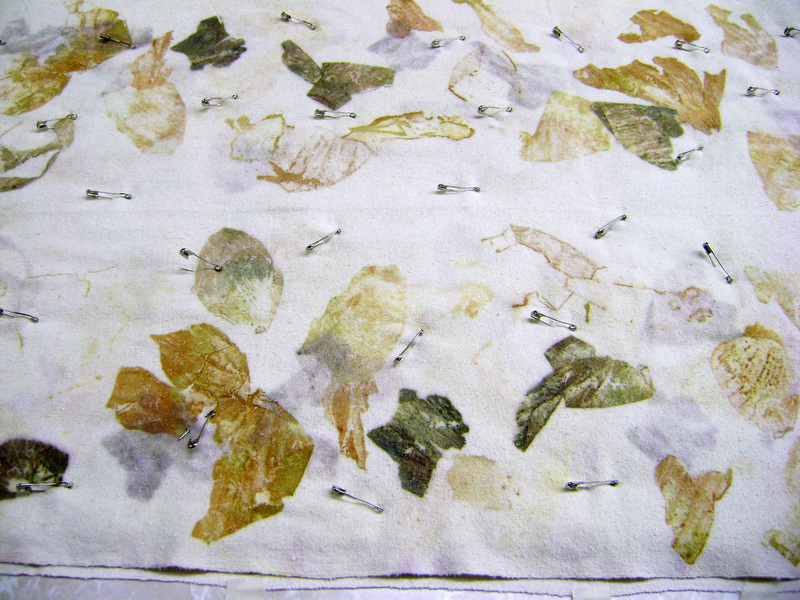 The first batch is now rinsed, washed, and dried, but there is more to go…and then there’s all that ironing….